Bev Valle, you were right. What a great lecture and awesome workshop. Leslie is a lively speaker and great teacher. I know I came away with an even greater appreciation for miniature quilting. With the title of the lecture “We’re Talking Small”, Leslie spoke of the difference between little, petite, and miniature. Little quilts is a phrase used by a shop in Georgia. The Little Quilt Shop has a few books out containing patterns where the blocks are small but not miniature. 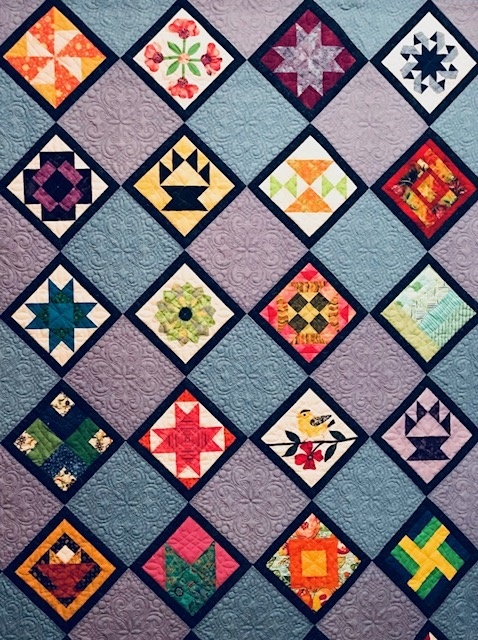 Miniature quilts are quilts made with blocks measuring 1″ finished or smaller. While Leslie’s work is small, she does not consider them true “miniatures”. She refers to them as petite. I like that term. It makes them seem more do-able. Leslie’s work in miniatures enables her to purchase many – many – many fabrics. As she explains to her painter husband, he can mix up what ever color he needs, but she must purchase her colors separately. Thus the need to purchase more fabric always exists. Sounds reasonable to me. Leslie considers herself to be a persnickety person when it comes to her quilting. Her quilting may be persnickety but her personality is anything but. She is patient, warm and funny. Leslie’s workshop was very informative. Whether you are a novice or an advanced quilter, you got something out of this class. The wealth of information was phenomenal, even if you just came away with how to make your own portable ironing surface. Leslie handed out her list of 20 tips. First, she went through her tips explaining the whys behind each tip. While her tips pertain to working with petite quilts, most are useful in working with larger quilts. We started off with a four patch block, placed in a nine patch setting. Leslie had sets of strips for everyone to choose from. I thought this was ingenious. It got us stitching right away. Through the process of making these blocks she went through her tips, from choosing fabrics, cutting, stitch length, pressing, accurate seam allowance, snipping seam allowances and so on. Most of us finished the four-patch/nine-patch around lunch. Some chose to put borders on in class. While others took them home to find just the right fabric for their borders. Leslie demonstrated how she uses the left side of her presser foot to create an accurate 1/4″ inner border. She also discussed her reasoning behind some of her border fabric choices. Our second project was a friendship star or churn dash block, which would be a finished size of 2 1/4″. Leslie had us choose a focus fabric from what we had brought. Then we were to choose at least 3 more coordinating fabrics. The focus would be the outer border. The others would be background, sashing and accent for the stars. Next we moved on to half square triangle blocks. Leslie’s tip on making these was to start big and trim. Our blocks were to be 3/4″ finished. So if you do the math 3/4″ + 7/8″ = 1 5/8″ cut. Now that’s way too small to work with accurately, at least for me it is. Leslie had us cut two 2″ blocks, mark one with a single diagonal line from one corner to another. With right sides together, stitch 1/4″ way from the drawn line on each side of the line. Then press to set the seam. Cut down the drawn line. Then press open. Now you need to cut your block down to 1 1/4″. Using a square ruler that has the 45 degree marked, place the 45 degree mark on the seam and trim your first two sides. Don’t worry about the measurement at this point just trim one corner of the block. Then turn it and trim your last two sides to 1 1/4″. Once we had our half square triangles, we were able to choose which setting we wanted to use, friendship star or churn dash. Leslie recommended we lay out our pieces before we sew, to make sure we have the half square triangles going in correct way. I think she jinxed me. Wouldn’t you know, I did just that. But of course I noticed too late. I have one dancing friendship star. Leslie doesn’t just work on one project at a time. She has many going at once. She will cut fabric and sort it for future projects. She will sit and sew 20 or 30 blocks at a time and put them in her possibilities basket. And when the mood strikes she will pick through her basket and make quilt tops. She piles tops up and quilts them while relaxing at night. Once she has a few done, she will bind a few of them at a time. Her reasoning is that you get in the flow of doing one thing and keep going. I was thinking, “Yeah, I get that.” But as I was working on my friendship stars, the idea really hit home. I can see myself sitting and spitting out a bunch of stars. You do get into a groove and it’s easy to keep going. I actually made enough half square triangles in class to make 8 blocks. I couldn’t decide which color I wanted to use so I used both. Which works out for me because I goofed on that one dancing star. I really really liked this workshop. I tried hard to keep this short, but as you can see, I did not succeed. I know Leslie teaches at the Maine quilt show, so if you missed her workshop, check next years Maine Quilt show to see if she’s teaching there. Thanks again for a great workshop Leslie. You have another stalker. Just like Bev, I want to take more of your classes . This entry was posted in Programs, Workshops and tagged Leslie Muir-Volpe, Miniature Quilts, Miniature Workshop.